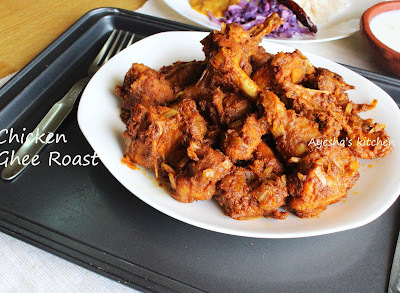 Let's have look on a Mangalorean delicasy...Chicken ghee roast. Mangalorean recipes are very famous for its authentic spices and taste. 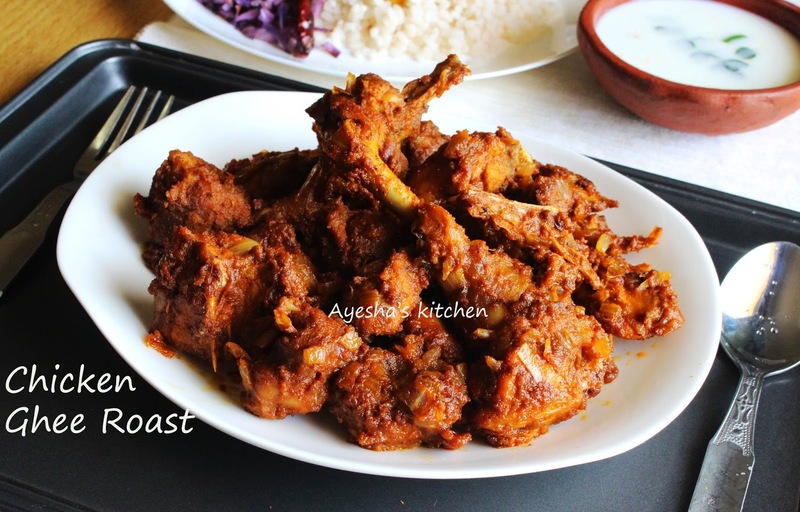 Mangalorean cuisine is a collective name given to the cuisine of tulu nadu region of India which comprises cuisines like udupi as well as the cuisine of other mangalorean communities. Udupi recipes and konkani recipes are very popular for many veg recipes. Chicken ghee roast, prawn ghee roast, tawa fish fry are some of the must try recipes that you can find in almost every Mangalore restaurant menu. Now grind these dry roasted spices along with curd, lemon juice, kashmir chili powder (do not use red chili powder), turmeric powder, ginger and garlic to a fine smooth paste. Marinate the washed chicken pieces with this marinade and salt. Set it aside for an hour. Now heat ghee/butter in a pan and saute the finely chopped onion well for few minutes. Now place the marinated chicken pieces along with the marinade. Fry it until the gravy becomes thick. When done add jaggery/sugar to it and give a fine stir. Cook until all the chicken pieces are well coated with the thick masala. When done garnish with curry leaves and serve hot with steamed rice or ghee rice.